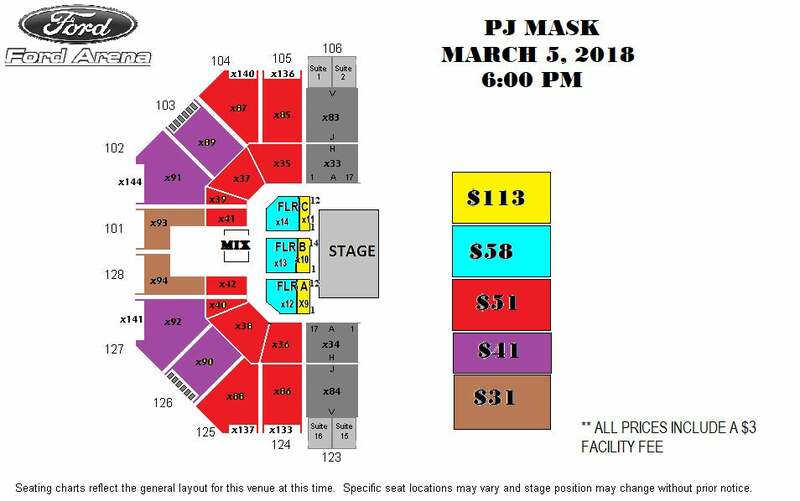 Groups 10+ Save On PJ MASK LIVE Seats! Deadline to place group orders is March 4. All tickets are subject to availability. Ticket prices include FMF and taxes. A one-time $5 processing charge will be applied to all group orders. For your convenience, there is a $7 charge to mail tickets. General parking will be $5. Ford Park now offers pre-paid parking tickets for events at the facility. Pre-paid parking can be purchased at the same time as you purchase your event tickets, either online through Ticketmaster or in person at the Box Office. Parking tickets may be purchased on the day of the event from the Box Office 2 hours prior to the event, or in cash with a parking attendant as you enter the facility parking lot.